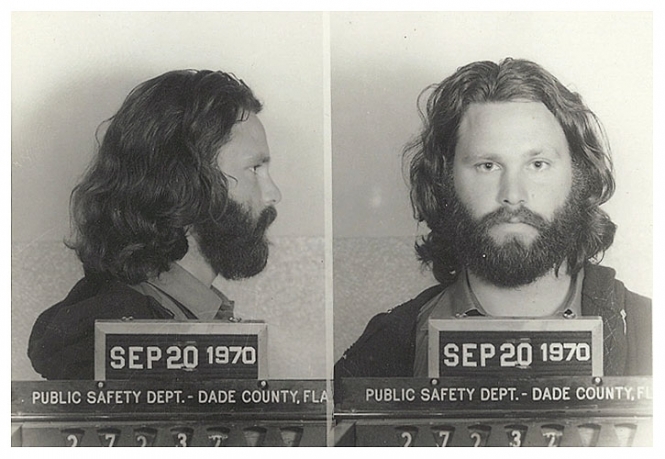 Jim Morrison posed for this mug shot following his 1970 conviction in Florida on misdemeanor indecent exposure and profanity charges. The singer was busted after he exposed himself during a March 1969 concert in Miami. As seen here, Morrison, who was photographed by Dade County's Public Safety Department, testified on his own behalf at trial. Submitted by Jack Black on Wed, 2011-03-23 18:26. Submitted by sizerz on Wed, 2010-12-01 18:03. Submitted by roydawgg on Mon, 2010-11-15 02:44. Submitted by sizerz on Wed, 2010-12-01 18:00.
you've obviously never listened to anything he's had to say. it's okay. just don't spew ignorance all over just because you can... it's unbecoming. Submitted by wandabyrd on Thu, 2010-10-07 08:40. Submitted by Shelly Shores on Tue, 2010-08-31 05:28. He was a great singer, but he was nuts. Submitted by Watsons Pills on Wed, 2011-04-06 01:09. Amen. But most creative people a little off the radar screen? i agree, he was a little off, but he's amazing.